And its name will be is Pepper&Carrot! I'll keep the little witch and the cat of the webcomic strip "Potion of Flight" I posted in May. I also switched my previous comic to use Creative Commons license and opened a account on Patreon (a new service to receive patronage, so I could do less Freelance comission and more webcomics). I also built a special page for the "Webcomics" categorie of this website. Wonderful cartoon gallery.Thank you for share this. I don't know if its just me not able to find the links, but do you sell any prints of your art, esp with regards to Pepper & Carrot? Or do you have another website selling prints? 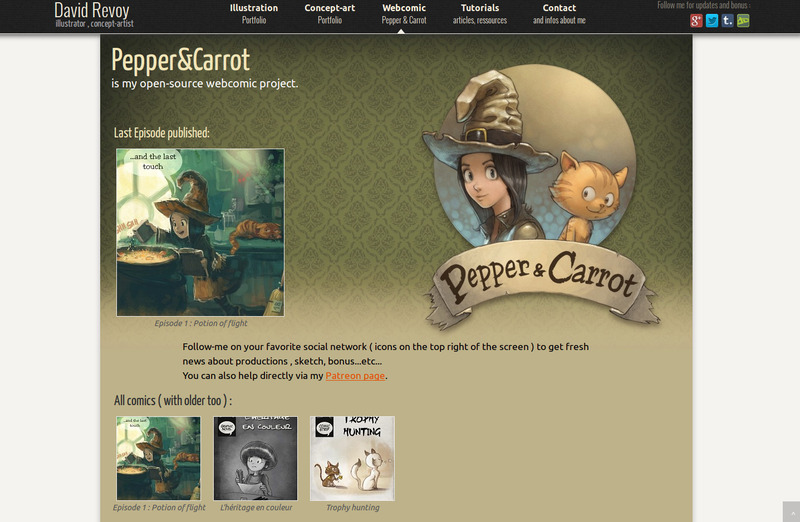 For the moment, I didn't setup anything specific to Pepper&Carrot. They propose poster, canvas printing, mugs, postcard, magnet printed from artworks. I'll try to developp this summer a proper eshop with specific designed products. I really like what you are making here, so much so I am printing them out as mini comics for my daughters. I was wondering though, what fonts have you used for the heading and bylines? @Craig : Thank you Craig ! The title for the font 'Pepper&Carrot' is a 'custom one' but not as a ttf file. Just a title art. It was designed to look a bit like http://www.dafont.com/jester.font with a bit of more pointyness, and erosion on the letters. I will send you some pics when I have printed them so you can put them up on the Pepper & Carrot site if you like. I think it is a great way for artists to make money directly using Patreon and the fact you have open sourced it is fantastic. I missed that github readme somehow. Thanks for the heads up. @Craig : Thank you for your encouragements about my way to redifine what should be art on internet :-) I hope you'll not have too hard time to manage episode 1 and 2 ( they were made at a time where I wasn't designing story with pages , but as a single long strip ; they can be hard to cut, but possible ). No worries about the first two episodes, I opened up the source files in Krita and cropped them to single files. Do you want them for the source downloads? PS. I own a little print company, prepress is my thing. @Craig : Ha, no need for the cropped files. My issue is with the translation ; episode 2 has now over 18 lang in separate SVG files, and refactor all ( cropping all SVGs ) with episode 1 could take days. So , I prefer to let them like this for the moment. Ho, prepress and printing ? nice ! Vraiment de superbes réalisation, bravo !! Est-ce que l'on peut se procurer tes bds en format papier ? My kiddo enjoyed reading all the 20 episodes. Eyecatching pesentation. Looking forward to more. Thanks for sharing.